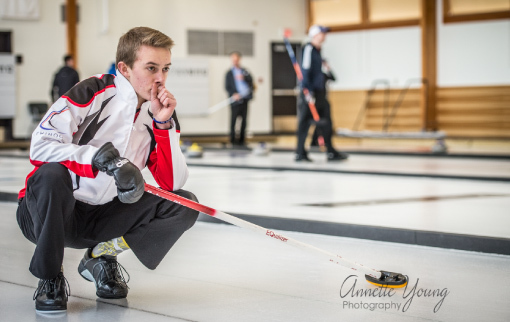 Like many young people in the Bow Valley, seventeen-year-old Desmond Young has a passion for sport. But, it might come as a surprise that his favourite isn’t skiing, climbing or mountain biking – it’s curling. “I really connected with it from the start. It’s a precision sport, and it’s all about balancing a number of factors and using a lot of mental focus. I enjoy that as it’s more about finesse than brute strength,” he says. Desmond hit the ice for his first game at age 10, shortly after Banff’s curling rink re-opened at the Fenland’s Arena in 2010. Desmond’s dad, Steve Young, recognized his son’s passion for the sport from the beginning. 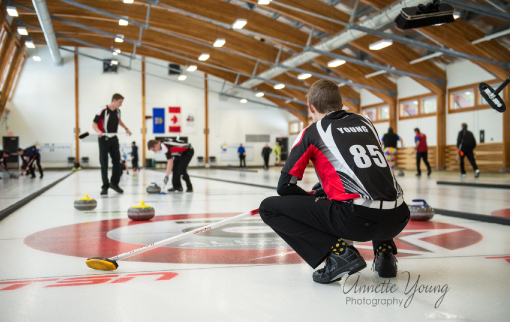 Seeing the need for more opportunities for youth people in Banff to enjoy the sport, Steve launched the first junior team at the Banff Curling Club in 2012. Here, Desmond continues to develop his skills in 2017. 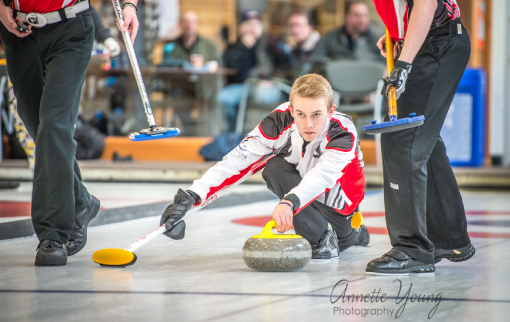 Throughout the winter, he plays on a team of junior curlers in a Monday night league in Banff, and then with a competitive curling team based out of Airdrie – where he practices every Tuesday, competing in the Alberta Junior Curling Tour every other weekend. Desmond will also curl on Wednesday evenings, playing in a Men’s league in Calgary. Year-round, he works to an aerobic fitness and strength training program to stay at the top of his game. But living outside a large city means that pursuing the sport competitively has had its challenges. 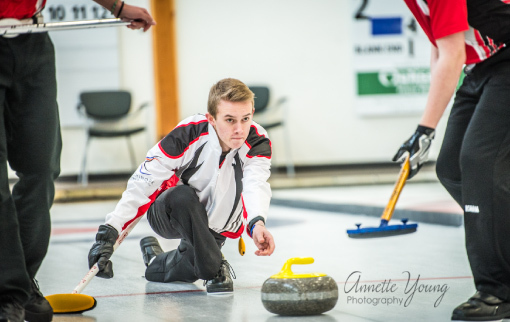 Across Alberta, most curling events are held closer to urban centres, requiring a commitment of extensive regular travel to compete, and Desmond must also regularly drive himself to Airdrie to practise with his team. In Banff, most of his peers dedicate their recreation time to other winter sports, so team recruitment and retention are an ongoing challenge. “A lot of my friends are bikers and cross country skiers, so their training involves very regular, vigorous physical activity. There aren’t many curlers here in Banff, and it’s not as physically demanding as other sports – so my friends bug me about it all the time. Then we go curling in gym class, and I get the last laugh,” Desmond says good-naturedly. But when there’s a will, there’s a way, and he is happy to go the distance for his curling commute, and to laugh off the little jokes from his peers. Banff Lodging Co. is also happy to help out through the company’s Pauw Foundation, supporting Desmond for his costs incurred for travelling to training and competitions around Alberta [Desmond is one of the Foundation’s 2017-18 Youth Sport Fund Athlete Squad Members; recognized for sporting commitments and ability, and consequently being awarded a sponsorship to assist with the costs of training and competing within their sport]. Desmond explains that in each curling match, there are four players, each with a different position: lead, second, third, and skip. The first three ‘throw’ the shots, and when they’re not throwing they’re ‘sweeping’ the ice to help the ‘rock’ keep its momentum toward the target. Desmond’s position is ‘skip’, and it’s a little different. “The skip is down at the other end of the rink telling the team which shots to play, holding the broom, showing them the target, and sort of masterminding the whole strategy. There’s a little bit of pressure on the skip, but it’s definitely a team game,” Desmond says. So what would Desmond say to anyone interested in trying out curling, or coming back to the sport?